VBA Classes Registration Closing in a Few Hours – Join Now! Click here to join our VBA Class now. How many people have joined so far? At the time of writing this post (around 7:30 AM, Indian Time on 20th May), we have 351 participants in this program. This is certainly quite a bit more than what I expected. But, I am also confident and eager to help as many of you as possible. So go ahead and join the program, because, you want to be awesome. You can watch lessons whenever you want: There are no live classes. So you do not have to be online at any specific time. You can enjoy a vacation or busy on work and still be able to learn VBA in your free time. You get a course completion certificate: At the end of 6 months, you will receive a course completion certificate from us. 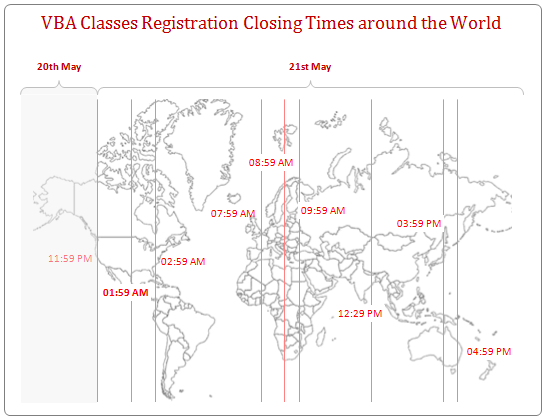 When Exactly do the registrations close? Or download our VBA classes registration count-down timer app. When is the next batch of VBA Class? Some of you are asking when is the next batch of VBA class. We are planning to re-open this course in September 2011. But, if we get too many students in this batch, we may be busy for few more weeks than originally planned. So go ahead and join the class today. We (Hui, Vijay and myself) thank you very much for supporting our first batch of VBA class. We are really eager to kick start the program on next Monday (23rd) and share our VBA knowledge with you. We are also hopeful to learn from your questions, ideas and tips so that all of us can benefit from this. PS: Of course, we have a lesson on how the count-down timer app is created in our VBA class. Join us. Hey Chandoo, that map chart looks fantastic. How do you get the scatter points to become lines and how do you apply the date brackets at the top of the chart? @KB... thanks. The scatter plot has error bars. The date brackets are manually added on top. For a more detailed tutorial, visit http://chandoo.org/wp/2010/09/29/excel-school-3-final-call/ and scroll to bottom of the post for the tutorial. Please i have registered for the VBA classses however i am unable to log in with the login details sent to me, i have sent you about 3 emails and my issue has not yet been resolved. Can you kindly have a look as i am eager to start my lessons.